For their magical wedding on a roof garden in Kensington this May 2016, Saleem Khalid and Maria Walsh chose pink as the colour for their special day. The colour of love and romance was perfect for floral arrangements and delightful decorative touches. Baby pink roses, peonies and carnations were showcase alongside white blooms in bouquets and table decorations. Guests were treated to a beautiful reception on the roof terrace with soft pink peonies and delphiniums to decorate tables and pink lanterns floating overhead. And the bride and groom were celebrated in a shower of rose petals to mark a truly beautiful day. Read on to find out how wedding florist Todich Floral Design created the arrangements and find inspiration for upcoming nuptials. Baby pink bridal flowers. Fitting for the romantic, magical theme, the bride opted for a flowing bouquet featuring white and baby pink, peonies and delicate astilbe. Soft greens complemented the pastel arrangement. In harmony with the bride’s bouquet, buttonholes featured pink and white roses and astilbe, and the bridesmaids flowers were arrangements of pink and white rose and gysophilia. Gysophilia, also known as baby’s breath, is a favourite flower for spring and summer weddings. Fairytale wedding arch. The wedding arch is a popular choice for couples holding civil ceremonies and represents the future home the bride and groom will live in. Saleem and Maria said their vows under an arch of foliage and pale pink carnations (later mirrored in the marquee decorations). The arch was made all the more beautiful by the white surroundings during the ceremony which lifted the greens and pinks of the display. Petal confetti. The moment when the bride and groom arrive at the venue is a truly special one, and the photo opportunity is made all the more lovely by the appreciation of the guests as they throw a gesture to celebrate the new couple. Rather than rice or confetti, at this wedding the bride and groom were showered with pink and white rose petals. These were flung from the flower girls’ wicker baskets and white cones for guests. Romantic wedding reception flowers. 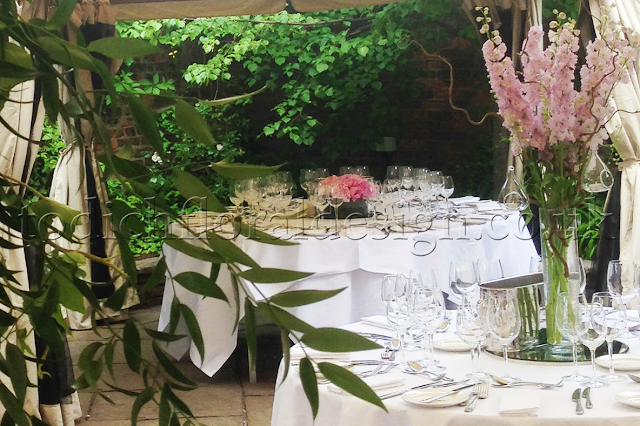 Set on a stunning roof garden terrace in London’s Kensington, the reception set a tone of romance and quiet splendor. 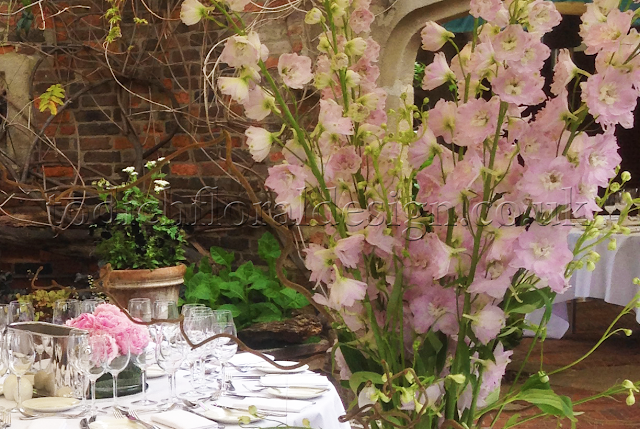 Tables were decorated with pink delphiniums, willow and glittering tea lights. 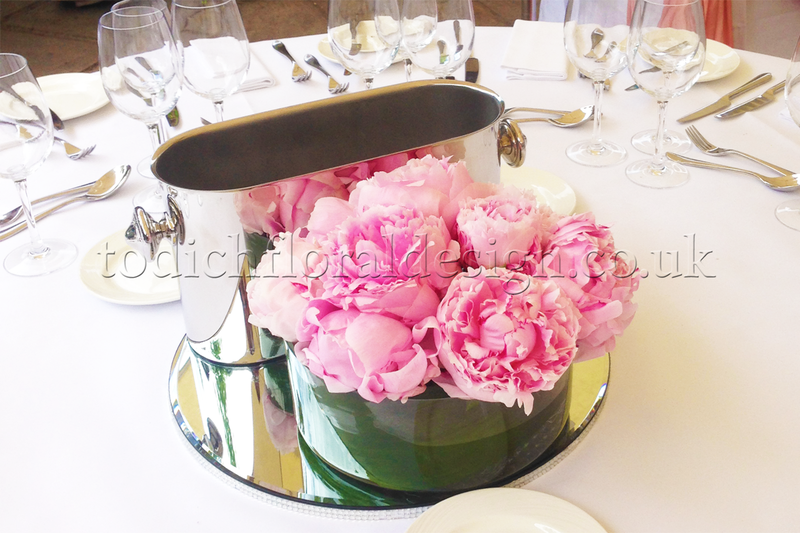 Guests also enjoyed a scented pink peony display arranged in low clear vases to make up beautiful domes of colour. 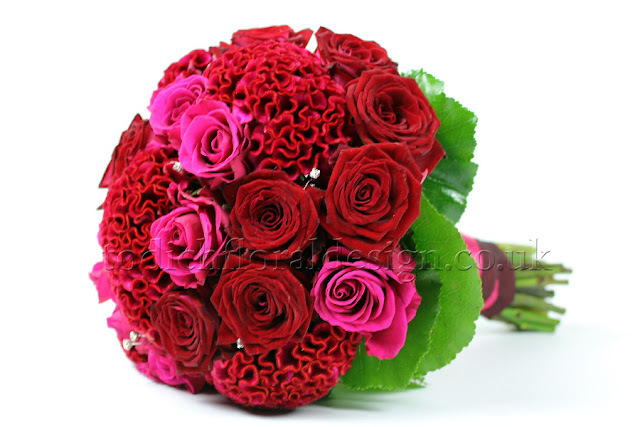 carnations created a fairytale look fit for a princess. Fleur de Lace provided pink lanterns to hang above guests for the evening under the marquee and pink flamingos were also on display to add an element of fun! At the bar, a single pink peony floated ethereally in a fishbowl. And for a grand flourish, stunning pedestal flower displays were created with pink and white hydrangeas, roses, lilies and delphiniums with mixed greenery to enhance the shades. How to incorporate Halloween wedding flowers into autumnal weddings? For many people, their wedding will be one of the biggest events they will plan in their lives. Halloween wedding flowers and Halloween wedding bouquets are the perfect way to add a spice of individuality to your big day. Although a traditionally unpopular time of the year, having a wedding around Halloween time has become a popular alternative for many couples, particularly those on a budget. Not only does this time of year often fall on venues’ off-peak timescale, resulting in lower charges for venue hire and catering, but it also means you can often get a great deal on Halloween wedding flowers and wedding decorations. If you’re lucky, you might also catch the tail-ends of a warmer summer too, which always helps guests enjoy themselves on the day. It is important for couples to choose the right flowers for their wedding; they can literally make or break the design of a venue, and really set the tone for the whole evening. The space in average venues can be completely transformed depending on not just how you utilise the space, but the types of flowers and the details on them that you can fill it with. One of the great things about flower arrangements, apart from their timeless beauty, is the ability to completely alter your environment depending on your theme and the flowers you choose to put together. For Halloween-inspired weddings, think creative influences and touches throughout the day rather than a man dressed in a pumpkin suit (although if Halloween wedding costume ideas is the route you want to go down you can always provide Halloween-themed arts and crafts at the reception drinks for your guests to let loose on)! Especially when it comes to Halloween wedding bouquets and Halloween wedding centrepieces, our subtle hints of oranges, yellows and reds scattered amongst ivory cream palettes will add a warm depth to your pieces, whilst keeping in tune with the season’s theme. The Halloween wedding bouquet especially can be a great focal point of the wedding outfits; wild flowers can be used in between beautifully soft yellows with hints of orange entwined with deep green foliage in order to create a structured yet natural bouquet. This can be replicated on a smaller scale for the Halloween wedding bouquets for the bridesmaids, so that a line of continuity runs throughout the Halloween wedding flowers and helps develop the theme of the day without being an overbearing addition. Autumn offers the opportunity for brides to create truly stunning and unique looks to reflect the colours of the season. 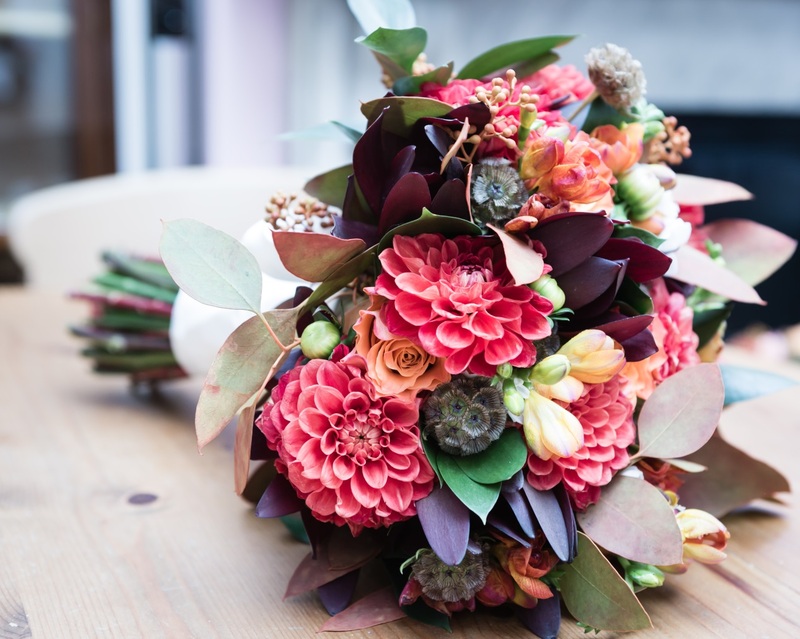 Autumnal bridal bouquets can be rich and colourful, incorporating natural elements like leaves and berries, while bridal hairstyles can also include the beautiful flowers and produce of the season. These flowers will look beautiful with the white of a wedding dress, but autumn is a season that is ripe for uniqueness and experimentation and many brides may choose a non-traditional colour. Read on for fall wedding ideas and inspiration for bridal style for this special day. Dressing for the occasion. White is, of course, traditional but ivory or cream is also a wonderful choice of dress shade for an autumn bride. Darker elements to reflect the bounty of the season could also be incorporate in a sash or ribbon additions – in shades such as purple or red – or the shoes could be a bold colour peeking from under a white dress. A less traditional bride may choose a dress in a shade such as peach, green or even red which would like beautiful for an autumn wedding theme. If it’s chilly, the bride could also wear a faux fur or sparkly bolero or shrug to add a glamorous element to her look. Select bridesmaids dresses in the rich colours of the season, such as plum, burgundy, crimson or apricot. These will look stunning when paired with the white bridal dress and the bold colours of the autumn wedding bouquets. Tartan elements could be incorporated into the attire of the male member of the wedding party and button holes can include autumnal elements like thistles, berries, acorns and leaves. Autumn bridal hairstyles. Flower crowns are very on-trend at the moment, but they don’t just have to feature at festivals or summer weddings. The months of September, October and November offer an abundance of flowers and other options for autumnal bridal flowers whether a subtle or more dramatic looks is desired. Add red, pink or white roses for a romantic look, or choose dahlias or chrysanthemums in bright autumn colours like orange and yellow. There are plenty of natural elements that can also be incorporated, such as oak leaves, ivy, twigs and even blackberries and red berries to create an abundant and colourful crown. For a more subtle look, wind leaves (that could be spray painted gold) into a glamorous up-do, or incorporate autumnal bridal flowers into a hair style by fixing them to a head band or comb. Miniature roses, freesias or orange orchids would work very well for this look. A jewelled 1920s headband is another great option for autumn weddings – glamorous, elegant and truly beautiful. Autumnal bridal flowers. The season offers so many choices for colour themes – from rusty reds to deep purples and bright yellows – and autumnal wedding bouquets are truly striking affairs. Any wedding florist in London can create the perfect look to suit the theme and style of the wedding, whether the look is bold or more subtle. Full flowers like roses, peonies and anemones can be paired with delicate baby’s breath and wildflowers, framed with the verdant autumn foliage on offer this season. Other elements like berries and leaves can also be incorporated to create unique looks to suit the bride’s style. Table centerpieces are large focal point at a wedding and set the tone of the occasion. Whether you're after something grand and fabulous or minimal and simplistic, it’s a great opportunity to get creative. Wedding reception flowers make beautiful wedding centrepieces, work as great focal points and decorate interiors beautifully. A little help from a London florist will assist you in achieving your desired style and depending on the look you’re after, added accessories can be used to achieve different looks. Here are some wedding flower arrangement ideas for inspiration. Vintage. Modern flower arrangements can often be too refined and coordinated. The perfect vintage wedding flower look is rustic, glamourous and has a garden feel to it. 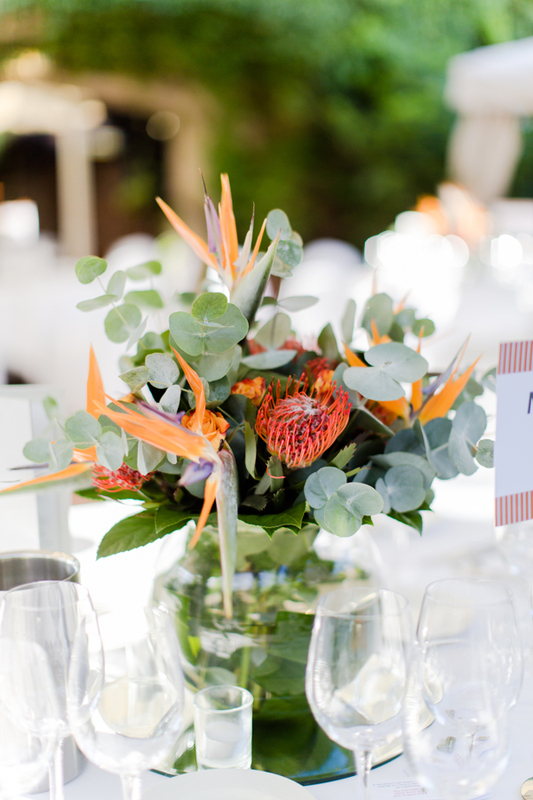 Your wedding flowers and decorations can be arranged with more of a personalised look. For a vintage feel, glass or coloured bottles work beautifully for storing wedding flowers, they’re quirky, cost effective and look delightful. Whether they’re used to hold single flowers such as large peonies or arrangements of garden roses or sweet peas, they make wonderful vintage arrangements, and are sure to add edge to your table display. Rustic. For a casual looking centrepiece, bursting with character, opt for wooden tables and clear or coloured jam jars or even a vase to house your flower arrangements along with plenty of greenery. 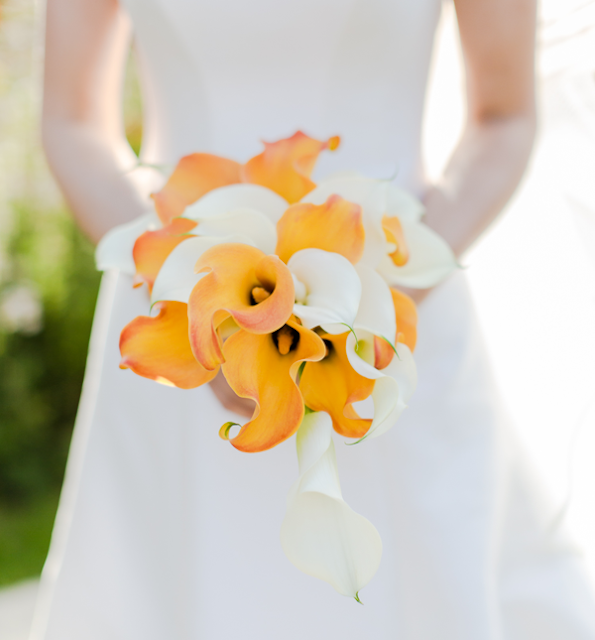 Using similar flowers to your bridal bouquet is a great way to continue your wedding theme throughout your big day. Wildflowers such as roses, peonies, stock, baby’s breath, Astilbe and dusty miller are a fitting choice and decorate vases and jam jars beautifully for a rustic affair. Grand statements. Candles work great for adding romance and intimacy to your big day and are an inexpensive way to add elegance. For a lasting statement, go big with a centrepiece that will be remembered and decorate your tables with large candles with luxuriant stands for the ultimate wow factor. Candles add charm and work as striking wedding decorations. Match with similar vases to accent your table flowers beautifully. Minimalistic. There’s beauty in the simple things. If you’re after a classy and simplistic affair, a good vase can add character and enhance the look of floral arrangements. Glass vases add a clean, contemporary and minimalist look to centrepieces. A square glass vase looks great lined with Ti-leaves are filled with pebbles, rocks, water and simple flowers such as Calla-lilies. Colour contrast. It’s nice to have matching flowers, but just as great is a centre piece that stands out, one that’s vibrant and memorable. Pairing contrasting colours or various shades of a single colour, are a great way to add depth and dimension to wedding flower arrangements and add charm to your reception. Simplistic. A well set out table with an an attractive focal point may be all you need for to create a charming centrepiece. White candle lanterns surrounded with elegant flowers such as baby’s breath, look simplistic yet sophisticated. There are so many options to choose from when decorating your reception other than choosing wedding floral designs, the best centrepieces are one are personalised and say something about you. How would you like to win £500 worth of wedding flowers for your big day? London wedding florist Todich Floral Design is offering just that! Simply register for FREE to be in with a chance of winning £500 worth of stunning wedding flowers for your London wedding. 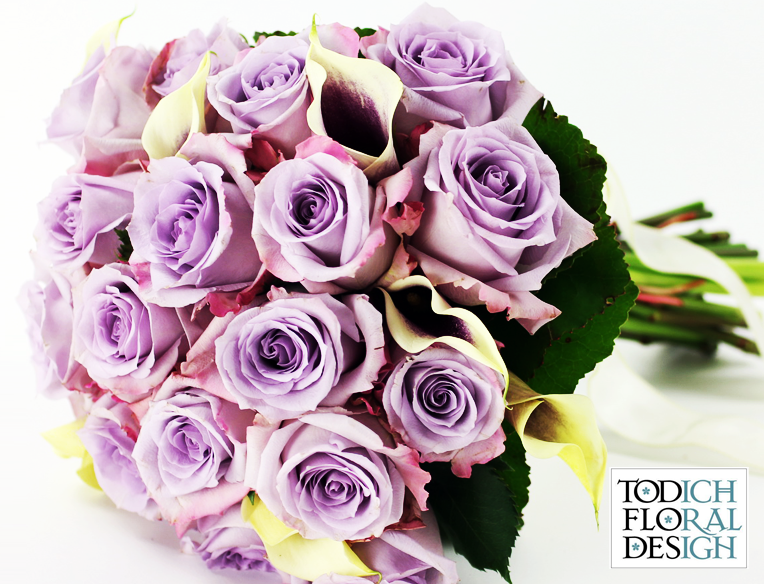 Todich Floral Design are considered experts when it comes to exceptional and attractive-looking wedding flowers. We have a wide range of fresh flowers for you to choose from, in a number of different colours, shapes and varieties. We have beautiful bridal bouquets, bridesmaid posies, buttonholes and corsages, venue decorations – the complete works! 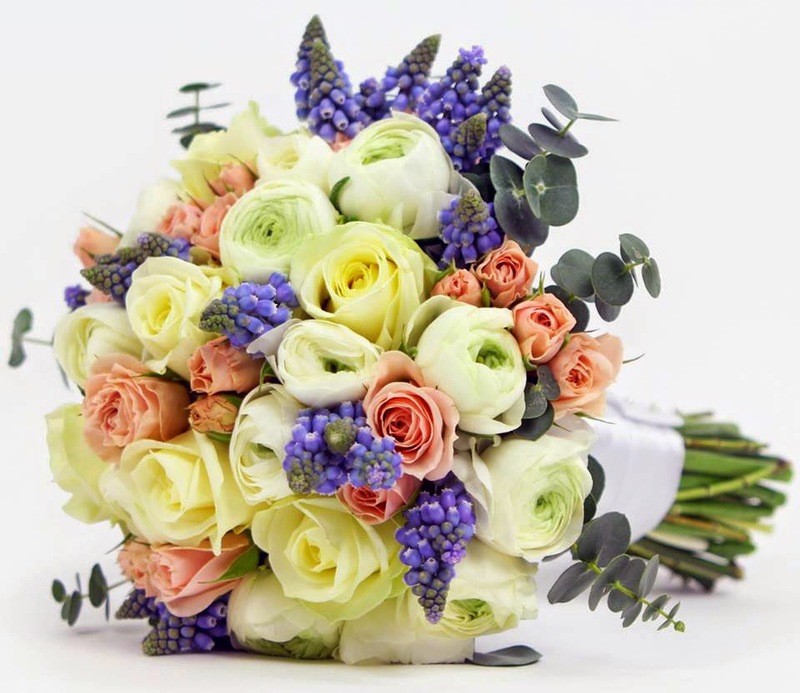 Our bridal flowers and bridesmaid bouquets come in several different shapes and styles, including the traditional round posy, teardrop bouquets, heart-shaped flower bouquets, cascading bouquets, oval bouquets and loose round bouquets. Whatever style you want, we can create it for you. We also have a large selection of decorations, containers, props and vases available to hire on your special day, making your venue look truly spectacular! Our team of skilful floral designers and wedding florists will work together with you right from the offset, making sure that the flowers we arrange for you are just what you imagined – and more! And, with over 15 years’ in the industry, we can offer you expert advice on things like style, design and colour schemes which will perfectly reflect your personality, style and wedding theme. 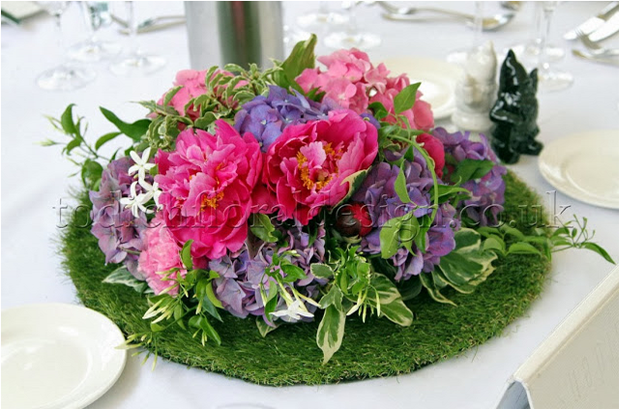 From chic, modern wedding flowers to traditional church pew ends, candelabras and table centrepieces, we have gained a fantastic reputation for creating spectacular floral arrangements and an first-class service. We will provide a FREE consultation at a location of your choice and will discuss all your wedding flower requirements. And, if you want to be bang up to date with the designs for your wedding flowers, we can also help with ideas based on bridal bouquet designs for 2015 and bridal posies for 2015. We also offer professional installation of your wedding flowers and floral decorations, wedding flower delivery in London and the rest of the UK during the week and on weekends and bespoke designs that perfectly fit your individual needs and requirements. Todich Floral Design has worked with a number of top London wedding venues over the years, including Café Royal, Mandarin Oriental Hotel, Dorchester Hotel, The National Portrait Gallery and numerous others. Wherever you decide to hold your wedding, we can totally transform it into a beautiful floral haven for you and you your guests. We want to make your special day as memorable as possible! So, what are you waiting for? If you are planning on getting married this year and having your wedding in London, why don’t you enter your details below and be in with a chance of winning a huge £500 worth of stunning wedding flowers? Who wouldn't love £500 taken off their final bill for wedding flowers?! It’s a great way to start off your wedding preparations! London brides looking to wed during spring this year may still be looking for the perfect gown which will be fitting for the season. If that’s you, then keep reading and find out what spring 2015 wedding dresses are available to you. Wedding stylists in London are predicting a very romantic theme for spring wedding dresses. They will look fresh, young; elegant and sophisticated, with lots of lace and flower designs (such as big petals). They will also use very delicate materials with a real emphasis on femininity, for example long lace veils and stunning hair accessories. Other popular dresses will include catholic style dresses with lots of lace, detailed bodices, embroidery and beading; full length gowns or very narrow fitting dresses. 2015 wedding dress trends. In 2015 you can expect to see high necklines (these were also very fashionable in 2013); lace sleeves (taking inspiration from the famous lace wedding dress worn by Kate Middleton); detailed backs (including open-back keyholes and beading, to modern and pleated trains); delicate, floaty dresses (such as slips, narrow straps and free, flowing empire-line gowns); sparkles and embellishments (including beading, sequins, lace and embroidery); 3 dimensional flowers, formed from materials like organza and silk; climbing hemlines; and inspiration taken from the Great Gatsby and the art deco period (think roaring ‘20s decadence with lots of detailing and sophisticated silhouettes). If you really want to make a statement in 2015, you will also want to be up-to-date with wedding flower trends too. Consider hiring a wedding florist in London to help guide you through all the different types of wedding bouquets and bridal flowers available to you, based on what’s in season for your chosen date. If you’re having a winter wedding, no doubt you will be looking into the many different kinds of winter wedding bouquet styles there are available. The search can be endless, so we have come up with a few winter bridal bouquet ideas for you! Use Casablanca lilies with silver mesh leaves brought together in a simple, ruffled ball and tied off with a silver bow for a simple but elegant wedding bouquet. Or, you could use white Vendela roses with lily of the valley for a traditional and romantic appearance. Should you wish to add more colour and texture, you could opt for deep purple roses with tiny paperwhites, decorated with glittered pinecones. These winter flowers make any bouquet, truly enchanting. Other winter wedding bouquet styles include beautifully fragranced white carnations, each with their own unique bloom, similar to a snowflake; you could also add bluey-grey juniper boughs and green arborvitae for a more striking shape and tie snowdrops to the end of each branch. Each of these winter wedding flowers are stunning in their own right, but it will depend on the Bride’s individual tastes, personality, style and -not to mention wedding gown- to find the perfect floral arrangement. If you need beautiful winter bridal flowers for your big day, then you’ll love these bridal bouquets that we’ve come up with. Cool water roses mixed with silver eucalyptus and eryngium give a real festive feel to wedding bouquets. Why not add some holly and berried ivy too, to really finish it off? Representing purity and new beginnings, traditional ivory flowers (such as sweet-smelling white carnations and crisp white roses) are always a favourite with winter brides. Deciding on the perfect winter wedding flowers will always take careful thought and consideration. 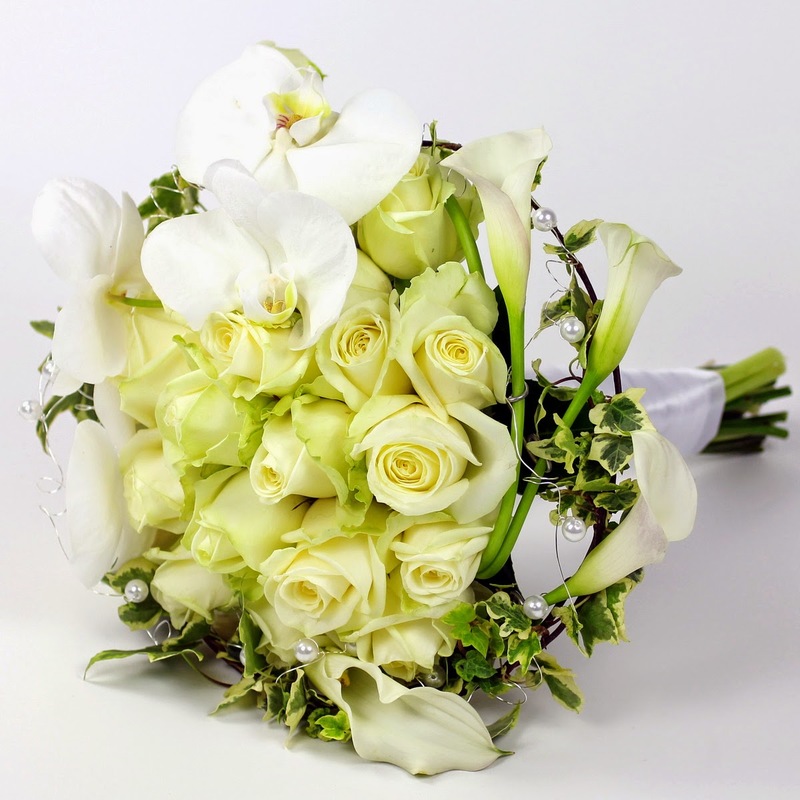 For brides married in London, contact a wedding florist to help you with your floral needs. They will provide expert knowledge on flowers and help you create a bouquet that perfectly complements your individual personality, style, colour scheme and wedding gown. 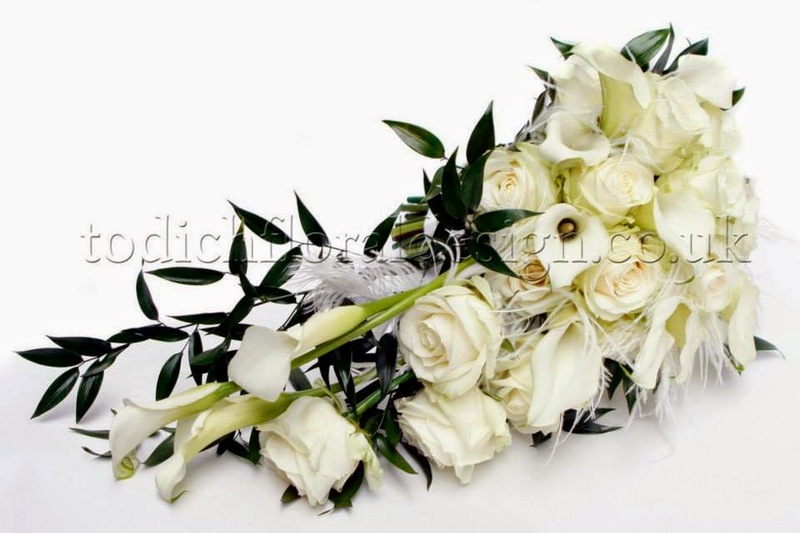 For more information visit todichfloraldesign.co.uk website. If you’d like to create your own Christmas wedding flowers, just follow these simple steps from our expert floral stylists in London to make your own simple tied bouquet. Use choice roses (we used a bloom from Kenya) of both spray and standard varieties (as one softens the other), and gather in the hand with a selection of colours (we used orange, pink and red). Create a dome shape and then fasten the bouquet together with florist tape (going round the stems several times). Next, take some foliage (we used plain green skimmia) and frame the beautifully coloured wedding flowers. Once in place, cut another piece of tape and secure over the stems. Finally, use a ribbon in a colour that matches the roses, and tie it off (making sure all the tape is covered, neatly); secure with two pins (going through the ribbon and the stems). And, there you have it: the perfect Christmas flowers for a winter wedding. This step-by-step guide of How to Create Christmas Wedding Flowers is perfect for wedding flower stylists or brides-to-be! If you’d like more wedding flower ideas, simply visit top wedding florist’s website which has a fantastic range of designs for you to take inspiration from!